Saleem Sinai is born on the stroke of midnight on 14th-15th August 1947, at the exact moment that India and Pakistan become separate, independent nations. From that moment on, his fate is mysteriously handcuffed to the history of his country. But Saleem's story starts almost thirty years earlier, when his grandfather, Dr Aadam Aziz, falls in love with a woman concealed behind a perforated sheet. That pivotal moment in Kashmir in 1919 sparks a series of bizarre events that will lead to a cryptic prophecy and the birth of a boy with an extraordinary destiny. Adapted by Ayeesha Menon, this dazzling dramatisation of Rushdie's many-layered, magical realist masterpiece is both an enthralling family saga and a riveting history of post-colonialism. First broadcast to mark the 70th anniversary of the Partition of India, it features Nikesh Patel as Saleem, with a star cast including Abhin Galeya, Meera Syal, Anneika Rose and Narinder Samra. 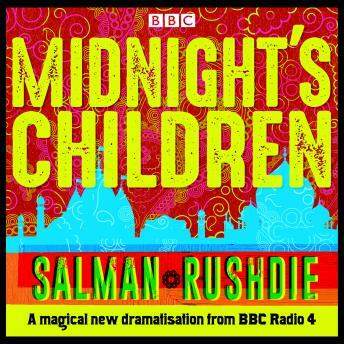 Also included is an interview with Salman Rushdie, in which the author talks to radio drama director Emma Harding about his multi-award winning novel. Midnight's Children won the Booker Prize in 1981, and was subsequently awarded the 'Booker of Bookers' prize in 1993 and 'The Best of the Booker' prize in 2008.
absolutely amazing! so glad to listend to it.